Under the direction and supervision of a Journeyman Sheet Metal Worker, you should be able to: Follow specific directions. Perform a variety of duties that may often change. Work within standards of accuracy. Repeat tasks of short duration according to a set procedure. Evaluate information using measurable standards. Plan, layout, fabricate, assemble, install and repair sheet metal parts, equipment and products, utilizing a knowledge of working characteristics of metallic and non-metallic materials, machining, and layout techniques. Use hand tools, power tools, machines, and equipment. Read and interpret blueprints, sketches, or product specifications to determine sequence and methods of fabricating, assembling and installing sheet metal products. Select gauge and type of sheet metal such as galvanized iron, copper, steel or aluminum. Use non-metallic material, such as plastic or fiberglass, according to product specifications. Layout and mark dimensions and reference lines on material using scribers, dividers, squares and rulers. Apply knowledge of shop mathematics and layout techniques to develop and trace patterns to product or parts (or use templates). Set up and operate fabricating machines such as shears, brakes, presses…forming rolls and routers to cut, bend block and form or straighten materials. Shape metal material over an anvil, block or other form, using hand tools. Trim, file, grind, de-burr, buff and smooth surfaces, using hand tools or portable power tools. Weld, solder, bolt, rivet, screw, clip, caulk and bond component parts to assemble products…using hand tools, power tools, and equipment. Install assemblies in a supportive framework according to blueprints…using hand tools, power tools, and lifting and handling devices. Inspect assemblies and installation for conformance to specifications…using measuring instruments required. May operate computer aided drafting (CAD) equipment to develop scale drawings of products or systems. May operate laser beam cutter or plasma cutter to cut patterns from sheet metal. May be designated by a type of metal such as Coppersmith or Tinsmith; or according to type of activity, such as special items installed by a Sheet Metal Worker or Service Mechanic. On-the-job and related training is also required. 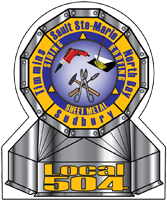 Workers must adhere to the Kitchener Sheet Metal Workers Local#562 Collective Bargaining Agreement. May be required to operate or work around powder-actuated hand tools such as ram-sets, Hilti-guns, etc. Employees will not be subjected to hazardous conditions without the proper safety equipment and training relative to the work being done. NOTE: The above description covers the principle duties and responsibilities of the job. The description shall not however, be construed as a complete listing of all miscellaneous, incidental or similar duties which may be required from day-to-day. The purpose of this job description is not to limit the jurisdictional claims of the Sheet Metal Workers’ International Association or the Sheet Metal Workers Local Union #504.